Bank loans and venture investment are both crucial sources of capital for growing businesses. But which does a better job of helping those companies grow and boosting entrepreneurship overall? To tackle that question, together with our co-author Rebel Cole, we analyzed data on small businesses that were compiled by the U.S. Census Bureau going back to 1995. The results were published in the Journal of International Financial Markets, Institutions, & Money. The conclusion? In general, venture capital plays a greater role in stimulating the formation and growth of new firms. Our first step was to look at the percentage change in the number of small companies in each state in the U.S., as well as growth in employment and payroll at those companies. Then we compared those numbers with the percentage change in venture investments and bank loans to startups in each state. The results: Higher levels of venture-capital investment meant more new startups and more growth at existing startups. We used statistical methods to establish that there was causality involved, not just correlation, and found a very strong causal link. Among the findings we uncovered were that the 15 states with the highest rate of growth in startup formation showed substantially higher levels of venture-capital investment compared with the slowest-growing states—a median growth rate of 12.05% in investment versus 3.93%. In contrast, the fastest- and slowest-growing startup states saw a much lower growth rate of bank loans—5.38% and 2.74%, respectively. Breaking down the results by company size, we found that the biggest winners from venture capital were companies with five to 19 employees. We found that a 10% increase in venture capital in a state was associated with a 2.6% increase in the number of firms with five to 19 employees, a 2.9% increase in the number of employees at those firms, and a 3.9% increase in total payroll. When it came to bank loans, firms with 20 to 99 employees seemed to benefit the most. While we find some evidence of growth associated with bank loans, the evidence for this is not as statistically robust. 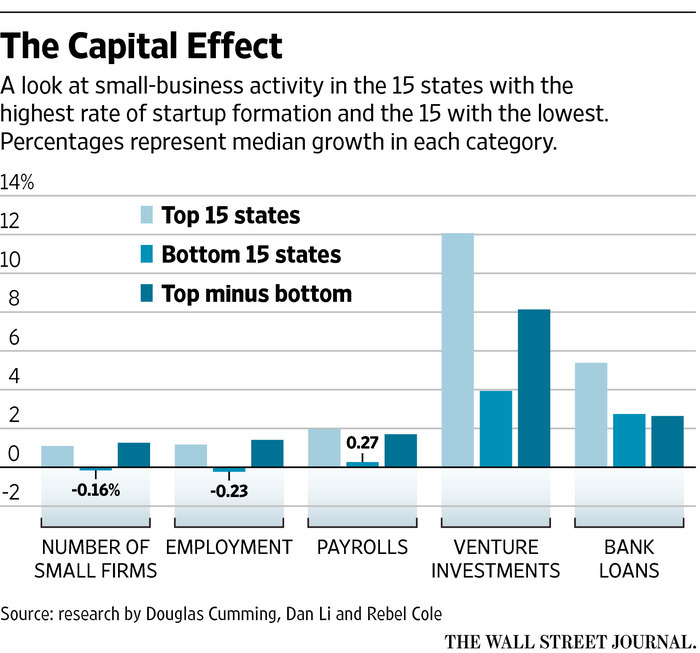 Really small businesses, those with fewer than five employees, seemed to be left behind by both types of capital providers. After controlling for other factors affecting firm growth, we fail to see any strong link between venture investment or bank loans and growth in these firms. Why does venture investment have more impact than bank loans, when loans are such a commonly used form of finance for entrepreneurs? It comes down to time and attention. Venture capitalists give entrepreneurs things that most lenders don’t—advice on structuring and building the business, for instance, and a network of contacts in a range of fields. Venture investors also encourage the firms under their guidance to grow, and encourage moves such as offering stock-option plans, which can help attract the top talent small firms need. For policy makers, we believe, the takeaway from all this is clear. Policies that encourage value-added, active venture investors will encourage more entrepreneurial activities and enable faster entrepreneurial growth.